A doctor on duty at a government hospital was allegedly assaulted by three men in Sawaimadhopur district of Rajasthan today. The incident occurred in the morning when Dr Mahendra Jain was writing prescriptions for patients at the government hospital, police said. 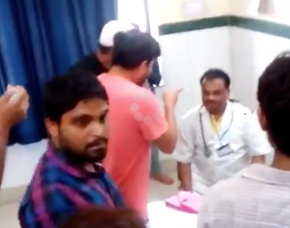 A purported video of the incident has also surfaced on social media in which the accused are seen slapping the doctor for using “foul language”. It was alleged that the doctor had angrily used foul language during a telephonic conversation with someone. This made the family members angry who began beating up the doctor, till the security intervened and took them out. The entire incident has been recorded and has then over social media. However, the police have not confirmed the authenticity of the video and the allegation on the doctor. Jain has lodged a complaint against the accused, identified as Mukesh Meena, Ravi Meena and Hansraj Meena, police said. “No arrest has been made and the matter is being probed,” the police added. The best part here is that the rude, arrogant and misbehaving doc got the same taste of medicine instantly. Can\’t believe we spend our youth, sacrifice our family lives and work 12 to 14 hours a day to get this type of treatment. Why would any one want to become a doctor? Napunsak tantra, andhee kanoon vyawastha, lachaar doctor..